Perfect for schools, hotels, caterers and cafes the Golden Crumpet is a super versatile breakfast product. Its neutral flavours allow the toppings to shine and make them a great breakfast carrier for a real point of difference. a real point of difference. They’re also vegan! So, a great option for your plant-based diners. 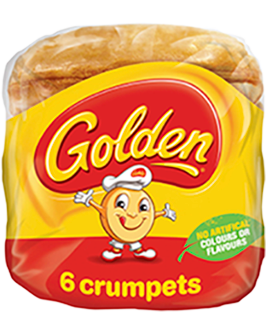 Golden Crumpets are now available frozen via foodservice distributors and can be kept in the freezer for six months, so you never have to worry about running out of stock. Get in touch with your local distributor to add frozen Golden Crumpets to your order.